For balloons, bubbles, sequins and sparkles come and join in with the fun at the Wimbledon Guild Village Fair, with an official opening by the fabulous Darcey Bussell CBE at 11 am. Taking place on the picturesque Wimbledon Common, The Wimbledon Guild Village Fair is the largest free outdoor event in South London. Catering for shopaholics, foodies and families alike with its huge range of entertainment including live music, food villages, shopping areas, children’s zones, horse show, fun dog show, raffle draw, photo booth and performances by local community groups. 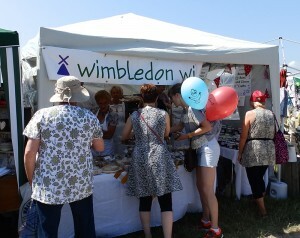 The Wimbledon Guild Village Fair is a great day out for everyone. 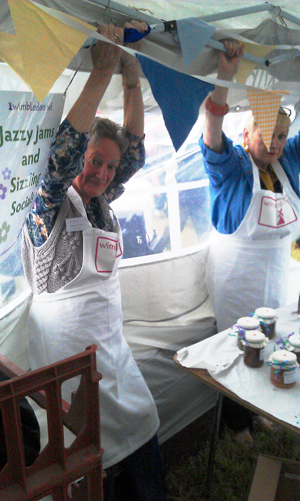 Our stall will be full of homemade cakes, jams and chutneys, come and say hello and pick up something delicious for tea! A lovely sunny day this year! From the application date in February this event takes five months in the planning. Our stall is our main fund raising event of the year and is important as funds raised go towards the hiring of our hall, paying for speakers, etc. Other fund raising events (e.g. bring and buy, raffle and plant sales) raise funds towards your chosen charity – this year it is Merton & Morden Guild. The day of the Village Fair was a beautiful sunny day throughout, to such an extent none of the visitors wished to go home and we were selling our last few preserves until 5.15pm. The drama of the winds last year was strangely missed but this year we all had more time to chat and enjoy the experience. 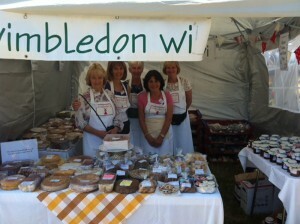 The WI produce looked very professional, so many people commented on our stall. We had an excellent position this year as requested. Our stall was on the path leading to Cannizaro Road which means we had a good chance of being seen as people arrived, and better still customers were reminded to buy on their way out. 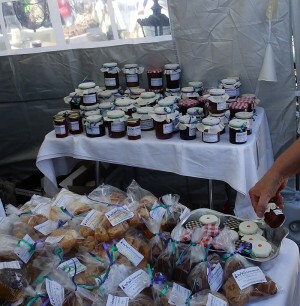 We were near the Farmers Market which turned out to be to our advantage as our prices were very competitive. 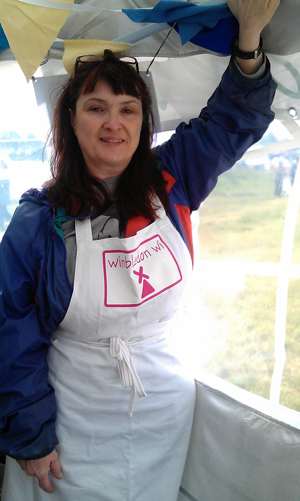 I would like to take this opportunity to thank all of you who helped make our WI Stall not only successful but most enjoyable for all of us who took part. Thank you to the COMMITTEE who helped me so much in co-ordinating our stall and for tolerating all my emails and attachments throughout the process. A very special thank you to Angela who so generously offered the use of her equipment and arranged the use of Lower Hall Sacred Heart. Edge Hill. These premises enabled us to have a drop off center prior to the packaging that takes place throughout the Friday before the Fair. Thank you to the Friday team who worked from 10am to 5pm packing and labelling all your lovely produce, and to Dulcie and Gillian who did an excellent job labelling an even larger selection this year of your preserves. And also to Val and Phil Barnes for providing the transport. Finally a big thank you to all the wonderful ladies on the Stall Volunteers Rota List for the day, and to all who contributed with cakes, biscuits, and preserves. – I have had some lovely emails from you. 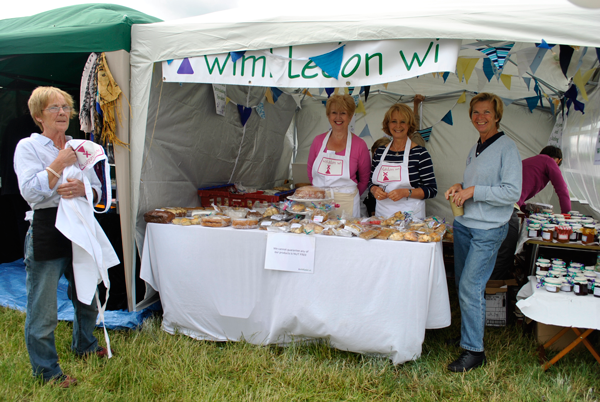 Many more of you provided produce this year for which we are so grateful and if we have reached our target of £1000 profit on our 6th year at the Fair – all credit will go to the ladies of the WIMBLEDON WI. Thank you everyone and put in your Dairies that the 2015 that Village Fair next year will be on Saturday 29th June. 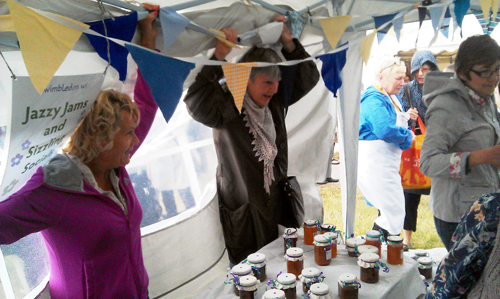 I feel sure you all would like to know how our 5th year having a WI stall at the Village Fair went. From the application date in February this event takes 5 months in the planning. Our stall is our main fund raising event of the year and is important as funds raised go towards the hiring of this hall, paying for speakers, etc. Other fund raising events (e.g. bring and buy, raffle and plant sales) raise funds towards your chosen charity – this year it is Carer Support Merton. The day of the Village Fair was a day of strong gusting winds throughout the day, as those who gallantly offered to help man our stall, or came to support us, will know. My lasting memory was seeing a rota of two ladies constantly holding the gazebo down. Louise had 9-10 slot until I realised that she had become a permanent fixture still holding the gazebo – 3 hours later. The produce flew off the table, not due to the wind thankfully. We had an excellent position this year as requested. Our stall was on the path leading to Cannizaro Road which means we had a good chance of being seen as people arrived, and better still customers were reminded to buy on their way out. The disadvantage of this position meant we were blasted more than most from the wind hitting our rear from the pond and then our side once our neighbours gave up and left. In spite of our gallant effort to stop our gazebo taking flight, we did sustain some damage which we hope will be repairable. A very special thank you to Angela who has so generously offered the use of her bakery, equipment and premises over the years to enable us to have a drop off centre prior to the packaging that takes place throughout the Friday before the Fair. Sadly Angela will be unable to offer her premises again so if anyone knows of a centrally located, large kitchen that we can use next year, please contact Agnes or a Committee member. Thank you to the Friday team who worked from 10am to 7.45pm packing and labelling all your lovely produce, and to Dulcie and Gillian who did an excellent job labelling an even larger selection this year of your preserves. And also to Val and Phil Barnes for providing the transport. And finally a big thank you to all the wonderful ladies on the Stall Volunteers Rota List for the day, and to all who contributed with cakes, biscuits, and preserves. 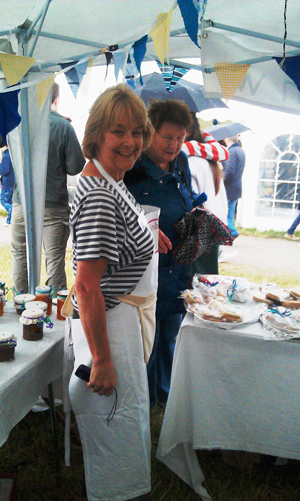 Many of you provided far more than expected – Rosie Hickson excelled making 12 banana cakes!! I have had some lovely emails from you and I am so glad none of you sustained injury while preventing our possible flight. Thank you everyone and put in your Diaries the 2014 that Village Fair next year will be on Saturday 21st June. In spite of the weather it was a “different” Saturday. It was so encouraging to see so many people supporting the Fair so that the weather really didn’t matter. Anyway the end result – of the money we collected – was very encouraging and I certainly enjoyed being part of the organising on Friday/Saturday. A big thank you to Veronica for all your effort.